A wonderful, and rare property on Lake Muskoka, with a superb point of land which provides privacy along with 320 feet of water frontage. Located on the north shore of Lake Muskoka between Bracebridge and Port Carling it offers south south-west exposure which ensures all day sun. Enjoy fun in the sun all day on the huge, gently slopping lawns leading down to the protected sandy swim cove with small sandy beach. The water gets deep very gradually and is only about 4 feet deep at a distance of 30 feet from the shore. Want deep water? We've got that too off the dock. The steel frame dock is brand new and includes a single slip boathouse with rare Muskoka room. End your day relaxing on the dock while gazing at the sunset. The cottage has just been upgraded with all new windows, all new exterior doors, new siding and eaves troughs. Inside it is pure old Muskoka charm with large principle rooms, gorgeous stone fireplace and 4 spacious bedrooms. Coming by spring of 2019: new upstairs bathroom with tub, main floor bathroom with shower, basement bathroom with shower; construction of a TV/media room in the basement; new kitchen (pictures to be posted). Graduated lawns bring you to a small shallow sandy beach area for swimming. Form a couple of teams and play championship volleyball, badminton and Bocce ball on the level grass. End your day on the point around a roaring fire, swapping bed time stories. Note: Prices displayed are in USD. For Canadian dollar rates see below. Panoramic lake views from your private beach. Enjoy your own private sandy beach with gentle slop. Perfect for young children. Panoramic south, south west views. On Lake Muskoka with 320 feet of lakefront, on a point, offering maximum privacy. Complimentary use of canoe and kayak. Dine al fresco on the deck, table with seating for 6. Relax in the patio lounge furniture. The cottage was nothing short of the description provided on the website and the stunning pictures . From the moment you walk in you feel right at home and waking up to the spectacular waterfront view takes all your city life worries away. Our family getaway weekend was incredibly perfect, we got to enjoy the beautiful fireplace and play board games and the weather held up all weekend so we got to enjoy 2 days of boating around the Muskoka lakes. This cottage is perfect for all types of family from little kiddies to older grandparents plus all the amenities you require to have an enjoyable stay. I highly recommend this cottage and we are looking forward to re-booking in the summer time for a longer stay. Enjoy !!! Bruce was nothing short of perfect. He is responsive, helpfull and methodical in greeting you to ensure that you are well prepared for your stay. The home is ideal for families and entertaining BBQ's, lounging by the KIDS friendly beach or sitting on the dock as a family gazing at the stars. I always hesitate to give such high recommendations, as it will most certainly create more awareness making it harder for me to stay here again, however, I would be remiss if I didn't. High on my grade for everything. We had such a wonderful time at the Lakehouse. Plenty of room for grandchildren to run and play. Our hosts were the best and helped make our stay so much fun. Beautiful home with a grand fireplace and all the up to date amenities you could ask for. Close to town with good restaurants less than 15 minutes away. Highly recommended and we will return for sure. It was wonderful having you and your family at our vacation home. I'm so glad you had a good time - it is an ideal place for three generations to vacation as there is something for everyone. Looking forward to seeing you again! 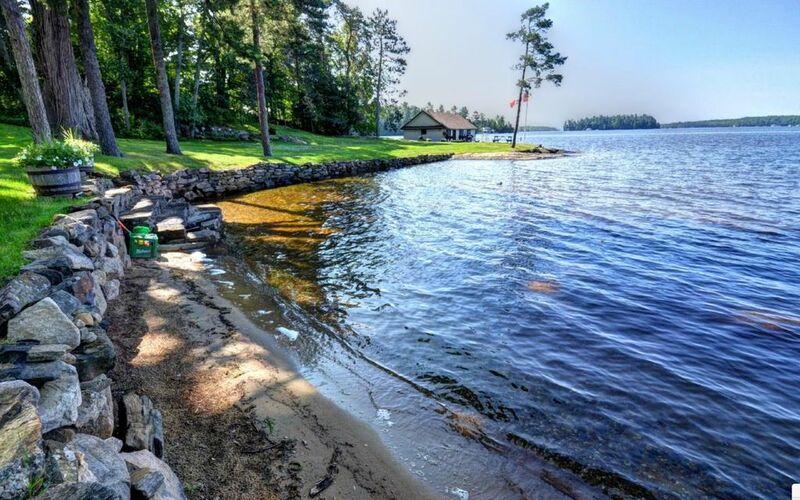 The cottage is perfectly situated with a gently sloping approach to the lake and sandy beach, fire pit, boathouse and swim/sun dock area and about 15 minute drive to nearby Bracebridge. Even has a golf cart to transport the lazier folks plus items necessary for relaxation down to the waterfront. Refrigerator in the boathouse is very convenient. Cottage is very well provisioned with about everything one could want. While there is no A/C, we never once in the 3+ weeks of our stay in July felt like we needed it as the evenings were very comfortable+ fans in every room plus extras if need be. Lovely deck with comfortable outdoor furniture, table for 6+ with umbrella and very nice grill. Owners Bruce and Gaye + son Greg were cordial, accommodating, and responsive hosts--a pure delight. We hope to return soon as our travels allow. An idyllic setting and upscale amenities make this the perfect Muskoka getaway. Spacious, luxurious, and comfortable - even better than anticipated. Can't imagine anything nicer. We just returned from 3 nights Thanksgiving weekend spent with friends in this beautiful Muskoka Lake cottage. What a nice place, clean and well maintained. This cottage is fully stocked with anything you need for comfortable stay. Just had to bring clothes, food and personal toiletries. Cozy interior, large bedrooms, comfortable beds. Great indoor fireplace, sunroom and large deck added a great touch as we spent all our time there. Too bad that weather wasn't great for the swimming, otherwise we would use nice beach. The grounds are very nice and clean. Fire pit and included firewood was great. Owner was friendly and well knowledgeable about local activities, attractions and surrounding areas. We're glad to hear you had an enjoyable Thanksgiving weekend at the Lake house. As the weather turns colder, the huge wood burning fireplace in the living room is a wonderful experience. Located on the north shore of Lake Muskoka between Port Carling and Bracebridge.